How can schools teach the skills required for a strong democracy to flourish? What Kind of Citizen? asks readers to imagine the kind of society they would like to live in - and then shows the ways in which schools can be used to make that vision a reality. Westheimer draws on groundbreaking research on school programs and policies to sharply critique the current direction of school reform. 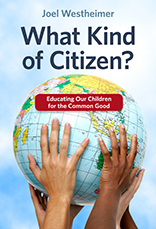 He points to the many varied and powerful ways to teach children and young adults to engage critically, to think about social issues, and to participate in authentic debate that acknowledges that intelligent adults can have different opinions. But today's teachers are being forced to abandon these practices in favor of test-preparation in only a very narrow set of academic subjects. How did this happen? What can we do to set schools back on the right track? How can we realign school goals with what research shows parents, children, and teachers actually care about? How can we save our schools from today's myopic interpretation of what constitutes an education? Westheimer answers these questions and makes a powerful call for schools to become more engaging, more democratic, and more educative.